Use your mouse to Scratch For Fun and see an example of how this game is played. Scratch for Fun examples do not award prizes. THE GAME HAS CLOSED. FINAL DATE TO CLAIM PRIZES IS 2/26/2020. 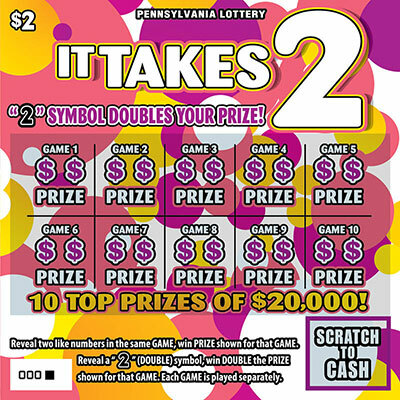 It Takes 2 is a $2 game that offers 10 top prizes of $20,000. Reveal two like numbers in the same GAME, win PRIZE shown for that GAME. 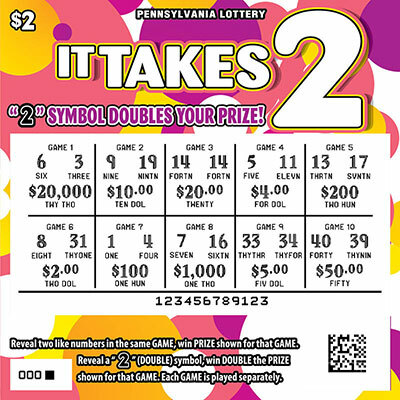 Reveal a "2" (DOUBLE) symbol, win DOUBLE the PRIZE shown for that GAME. Each GAME is played separately. *Scratch for Fun is for entertainment purposes only. Scratch for Fun examples may not accurately represent game play or overall chances of winning. For complete game rules see the game page.